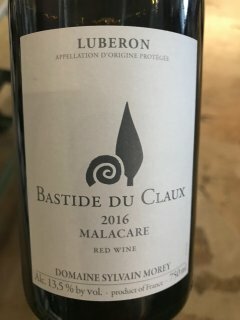 2016 Bastide du Claux Luberon Rouge - $17.99: Vins Rare, The finest selection of rare wines. Our road to the Luberon was forged through our relationships in Burgundy, of all places. Bastide du Claux was founded by Sylvain Morey, the son of Jean-Marc Morey, our long-adored vigneron in Chassagne-Montrachet. Thoughtful and strong-minded Sylvain left Burgundy determined to find his own way, settling down south in the historical but lesser-known region of the Luberon. We heard tales over the years of Sylvain’s “experiment” down south, but never found the time to take a closer look at his work. It was not until Sylvain returned to Burgundy, spurred by Jean-Marc’s retirement, to establish his own Domaine in Chassagne-Montrachet, that we were encouraged to make a visit to his small but interesting estate. To our delight, we were presented with a series of excellent wines which combine the elegance and purity of his experience in Burgundy with the unique cepages and terroirs of the Luberon. Bastide du Claux was born in 2002 and is located in the gorgeous hills of western Provence, in the heart of the Luberon National Park. Sylvain works a diverse group of parcels totaling 17 ha, planted to 14 different varietals scattered throughout the region. The vineyards of the Luberon are relatively high, at 400-450m above sea level, and benefit from cooler temperatures compared with other parts of Provence and the Southern Rhone. This unique climate makes the Luberon an excellent location for producing racy and exciting white wines as well as reds that retain a freshness and bite. Sylvain claims that upon his arrival in the Luberon, there were few if any producers bottling their own wines, the vast majority of the production made by local cooperatives. Many of the growers valued quantity over quality and began to replant vineyards so that they could produce the maximum amount of grapes possible and save money with machine harvesting. These trends made it possible for Sylvain to affordably purchase interesting, low-yielding old-vine parcels that were no longer valued. Sylvain’s Burgundian heritage really shows in his high standards of production. Harvests here can be quite late because of the cooler and relatively dry climate. All of the fruit for Sylvain’s wines is hand-harvested, with a rigorous selection made in the vineyards. Fermentations for white, red, and rosès are allowed to start on their own with indigenous yeasts. He attempts to do a gentle extraction for the reds with a minimal amount of remontage and no pigeage. Once fermentations are complete, the wines are aged in barrels of various sizes or concrete tanks before being bottled with only minimal filtration when needed.